Also available at other excellent booksellers. Divorce isn’t the greatest threat to marriage. Discouragement is. You’ve probably heard the grim facts: Half of all marriages end in divorce. The divorce rate inside the church is the same as outside. And, most marriages are just holding on. But what if these “facts” are actually myths? 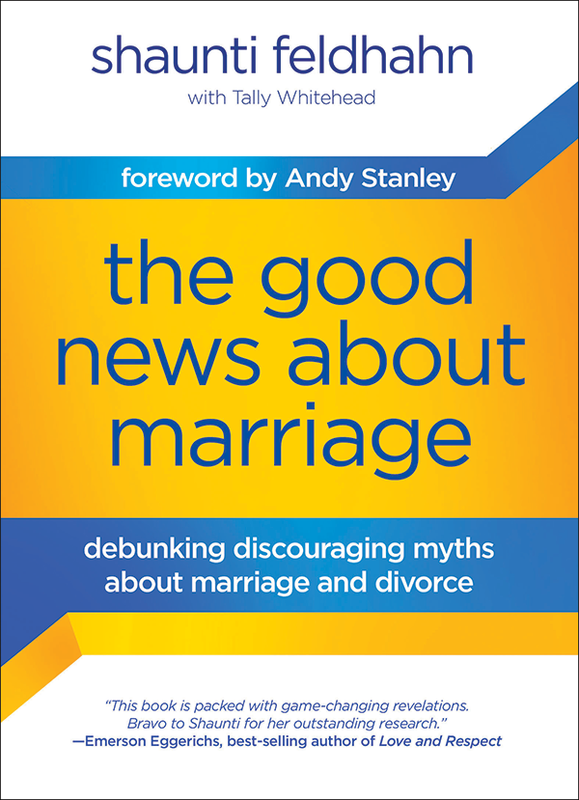 In The Good News About Marriage Tally and I document the big conclusion arising from those eight years of investigative research: Some of the most common and discouraging beliefs about marriage and divorce – beliefs that are stealing hope from millions of marriages — are simply not true! And although there is a great deal of actual good news out there, I don’t think any of it has made it into our conventional wisdom. While many very real concerns about marriage still exist, for too long we have been unnecessarily discouraged. It will restore hope to many marriages – and those who work with them! – if we are aware of the very real good news that also exists today. Shaunti Feldhahn is a Harvard-trained social researcher, popular speaker, and best-selling author. She started out as an analyst on Wall Street and now uses her analytical skill set to investigate life-changing truths about relationships. You can learn more here. Does your network, congregation or audience need this book? If you are a leader who wants to order The Good News About Marriage in quantity, please contact Waterbrook Multnomah Sales at Churches@WaterBrookMultnomah.com or 1-877-764-0850 for information about bulk purchases.